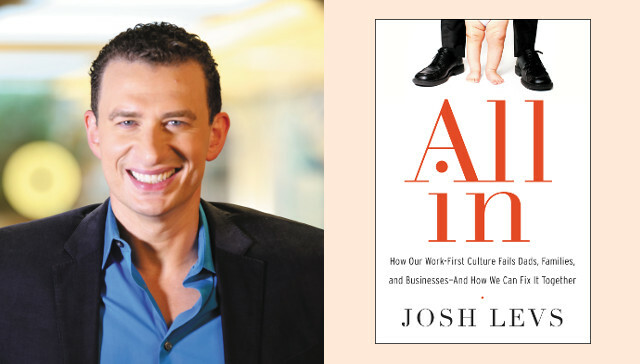 Josh Levs is a journalist, expert on issues facing modern families, and author of All In: How Our Work-First Culture Fails Dads, Families, and Businesses—And How We Can Fix It Together. After 20 years of reporting for NPR and CNN, Levs—a father of three—focuses his book on dispelling myths about today’s dads and moms, and explaining the necessity of new policies such as paid family leave. Levs tells his own story of taking on a policy at Time Warner that prevented him from being able to care for his newborn, preemie daughter and sick wife. As a result of his actions and the publicity surrounding them, the company revolutionized its policy, making it much better for dads and moms. The change made the company better and stronger. Levs keynotes and moderates events for all sorts of groups, businesses, and conferences. In motivational talks, such as his popular TEDx Talk, Levs tells the story of creating his own career, doing the unexpected, and reaping the rewards. Levs has received many of the highest honors in journalism, including six Peabody Awards and two Edward R. Murrow Awards. A scholarship was awarded in his name at his alma mater, Yale University, and he was named a Journalist of the Year by the Atlanta Press Club. Levs lives in Atlanta with his wife and children. More information at joshlevs.com. 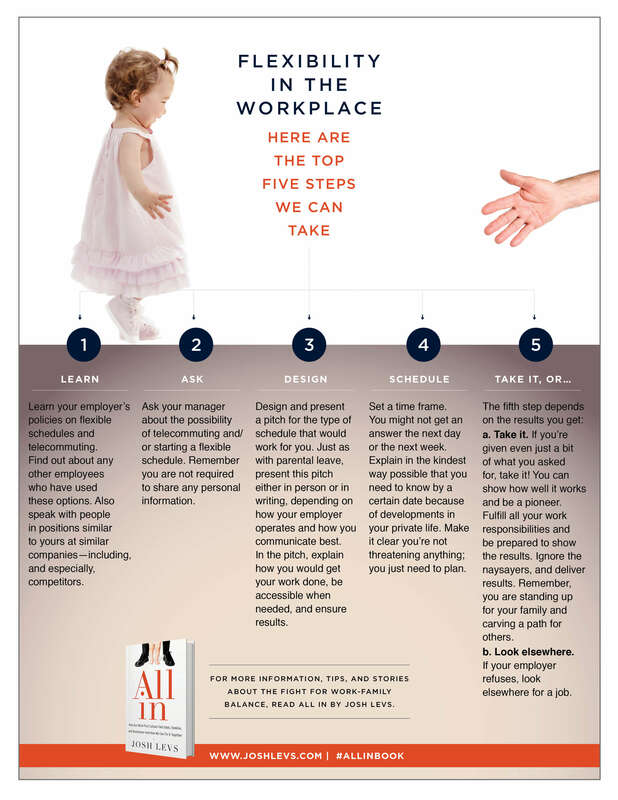 1MFWF: One of the reasons that work policies haven’t caught up with the needs of modern workers is, as you share, that “most executives are men who acknowledge they don’t make family a priority.” It might be tempting to assume, then, that most men in general don’t make family a priority. Is that true? Josh: It’s false. In fact, it’s not just slightly off—it’s the exact opposite of true! For All In, I did tons of research. I took my background as a fact checker on CNN, turned that lens on modern parenthood, and found that all sorts of popular beliefs are myths. The overwhelming majority of today’s dads value family over work, by far. Unfortunately, the CEOs of companies generally fall into the tiny subset of men who are the exceptions. And they raise up the ranks the few men who are like them. It’s proven, and called the “hours stigma.” Men get promotions and raises literally for sitting at their desks for more hours—not for getting more actual work done. Because it shows the executives that these men are like them, putting work first. Now, I work with businesses to help them see the light. When companies analyze employees by how much they got done in a set period—a month, a quarter, a year—they discover that those men who sit at their desks less are some of their most productive. This is a huge business incentive for supporting flexibility. I testified in favor of a workplace flexibility law in New Hampshire that would allow employees to request flexibility without being punished for it. It’s terrible that we need laws for this, but the fact is we do. In my testimony, I explained that it’s a pro-business bill. (It passed!) Some people around the country have been fired, demoted, and lost work opportunities simply for requesting flexibility. It’s time for this to stop. 1MFWF: The concept of an “ideal worker” stems from another time, when it was typical for men to head to the office while their wives stayed home to care for the family. These days, we know that this out-dated notion is damaging to women, helping to perpetuate the gender wage gap and the motherhood penalty. But it’s also damaging to men—how so? Josh: Our work structures were developed in the Mad Men era. When I do talks and workshops at businesses, conferences, and all kinds of organizations, this is where I start. You can’t fix a problem without diagnosing it. The work-life struggles men and women face today is a result of the way the modern workplace was structured. It was designed all around a type of work-life balance. And that balance was women stay home with babies while men work for money! The workplace was not designed for one person to have success in both places. Today’s dads want to have more time at home with our families. This is true not just in the United States, but all over the world. Legitimate studies and statistics show it. For All In, I interviewed dozens and dozens of men. For most of them, it marked the first time they had ever spoken out about this publicly. Men who take time off for caregiving or seek flexibility often get punished in the workplace. That’s bad for families and bad for businesses. In fact, it’s damaging the entire economy. Fixing this sexism is even part of what’s necessary for tackling our national debt. 1MFWF: Meanwhile, there’s another stereotype that needs addressing too: what you call a “‘doofus dad’ obsession” in pop culture. What do you mean by that, and why is it a problem? People who believe that men are lazy and uninvolved will never support gender equitable policies. Why allow paternity leave if the man is going to sit around and do nothing anyway? And think about the messages those pop culture images send to boys and girls about what to expect in adulthood. 1MFWF: You conducted more than 150 hours of interviews with men from all walks of life for All In. Is there a particular story that sticks with you the most? Josh: Marco Ponce. He was bussing my table at breakfast in San Francisco when we got to talking. His story is so important. He’s an immigrant and works three jobs just to put food on the table and keep a roof over his head. He basically only sees his kids when they’re asleep. To fix the crisis facing American parents, we have to tackle basic work structures. It’s a non-political statement—or at least it should be—to say that in this country, everyone should be able to work a 40-hour week and at least have a home and food. 1MFWF: It can be daunting to ask for something in the workplace. What steps do you recommend people take to get more flexibility at work—and why is it important for them to speak up? Since my background includes standing up to a policy decision at Time Warner, and the company ultimately revolutionizing its policy, I know big change can happen. These are the steps to get there.